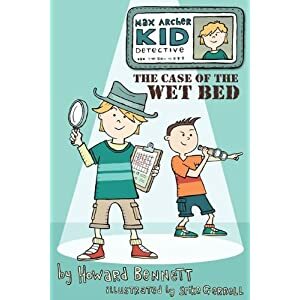 The Case of the Wet Bed « Howard J. Bennett - Pediatrician and Author in Washington, D.C.
Meet Max. Max Archer, Kid Detective. Max helps kids solve problems. Max’s friend Billy Parker is tired of waking up wet, and wants to figure out how to stop his bedwetting. Max knows how. He used to wet the bed, and he is ready to share his plan for staying dry. Join Max and become part of the Poop Patrol and Stream Team. Plus, be sure to check out the extra fun activities and the Q&A written for parents at the end of the book.